Disclaimer: The information on this page is intended for individuals who have been medically diagnosed with lateral epicondylitis (tennis elbow). If you suspect that you have lateral epicondylitis (tennis elbow) then it is important to visit a qualified medical professional in order to rule out any other possible causes prior to considering any advice or treatment option. If you answered yes to any of the above questions then using the OSMO Patch may well be one of the most important decisions you will make towards becoming free from elbow pain TODAY. The OSMO Patch is 100% natural and used in combination with proper rest is ideal for supporting the reduction in swelling and inflammation caused by tennis elbow. Let us first begin by getting a better understanding of tennis elbow, including what is tennis elbow, causes of tennis elbow, tennis elbow symptoms and also what is the best treatment for tennis elbow? Tennis elbow is a very painful inflammatory condition that involves the outer side of the forearm and elbow. The medical term for tennis elbow is “lateral epicondylitis” and although the condition can be common in individuals that play tennis, anyone can develop this condition. Tennis elbow is classified as an overuse or overload injury which results from injury and damage (small micro tears) in the tendon which attaches to the bony bump on the outside of the elbow (Lateral epicondyle). This inflamed tendon attaches the muscle at the front of the forearm that is responsible for the wrist bending backwards to the outside of the elbow, hence why pain can radiate up the outer forearm. Tennis elbow is caused by ongoing stresses that overtime result in the formation of small micro tears and scars in the tendon that attaches to the outer side of the elbow. Age related wear and tear of the tendons. Non-steroid anti-inflammatory drugs such as aspirin or ibuprofen. Analgesic medication in order to relieve pain. An injection with a steroid into the affected area. If you have already used or tried these medications and found little benefit. You may have a pre-existing condition which doesn’t permit you to take such medications. You may feel steroid injections for tennis elbow too painful, risky and invasive. On the other hand you may just prefer to use a 100% natural treatment for tennis elbow. 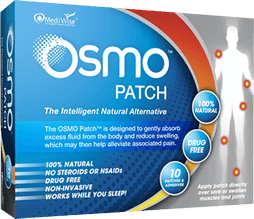 The OSMO Patch now offers an Intelligent 100% Natural Alternative! The OSMO Patch is specially designed to draw fluid from the body and reduce swelling, inflammation and associated pain. This makes the OSMO Patch a great natural choice for reducing inflammation, swelling and pain in the elbow which can then support your tennis elbow to begin to heal. The OSMO Patch is simply stuck over the affected area just before going to sleep where it can then go to work reducing inflammation and stimulating blood flow continually throughout the night. When you wake up in the morning simply remove and discard the used patch and repeat each night as required. So if you are ready for a natural & effective approach to supporting the relief of swelling, inflammation and pain due to tennis elbow then the OSMO Patch is the Answer!